If you want Rob Ford's John Hancock, you might have to shell out for a mayoral bobblehead. 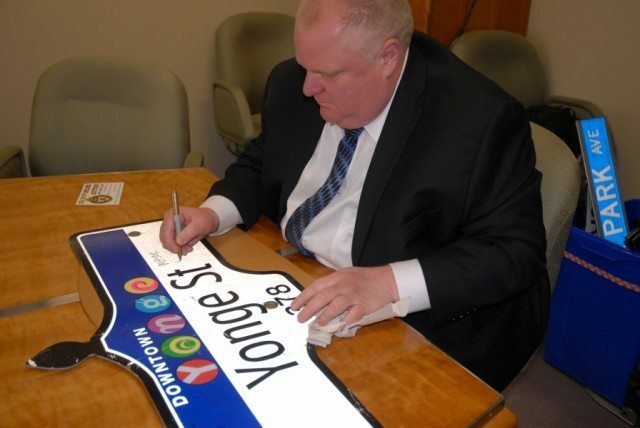 You now have just over 50 days left to place a bid on a decommissioned street sign autographed by Rob Ford—and after that window has closed, you’ll be out of luck. Bids on signs autographed by the mayor currently range from $245 (Bond Street) to $1305 (Yonge Street). It’s possible even Bond will at some point reach Yonge levels now that it’s clear these are limited editions.